Standlake is a village and civil parish situated on the A415 approximately 5 miles (8 km) southwest of the market town of Witney in the County of Oxfordshire. The city of Oxford lies some 10 miles(16 km) to the east. As of January 2013, the population of Standlake was approximately 1400 and there are some 560 dwellings.The River Windrush flows through the village and joins the River Thames at Newbridge, 2 miles (3 km) to the south. The village origins probably pre date the Roman occupation and archeological evidence has been found of occupation in both Roman and Anglo-Saxon times, while the church of St. Giles dates from the late 12 Century. 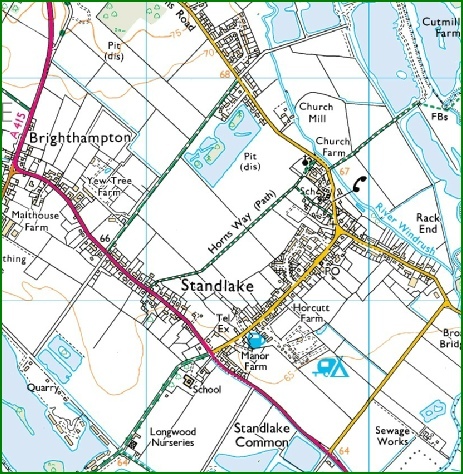 Standlake is surrounded by numerous artificial lakes dug for the commercial extraction of gravel. Many are now stocked with fish and popular with anglers; others are used for aquatic sports such as windsurfing. Standlake Arena is a locally owned and run 0.25 miles (0.4 km) oval racing circuit that hosts stock and banger car racing throughout the year. Oxford Downs Cricket Club has its ground at Standlake. It is a member of The Oxford Times Cherwell Cricket League. The Standlake Players is an amateur theatrical society. Established in October 2007 by a group of villagers and other locals, the group has held three productions a year in Standlake village hall on a newly renovated and modified stage. There are many other societies, clubs and organisations based in the village but also include residents from adjacent communities and these organisations are usually prefixed with the inclusive title of ‘Lower Windrush’. Their links are to the left and the locations of many are shown on the map below . Links to external agencies such as West Oxfordshire District Council (WODC), Oxfordshire County Council (OCC), Walking in Oxfordshire, Campaign For The Protection of Rural England (CPRE) Lower Windrush Valley Project (LWVP) and local Thames Valley Police are also listed below the local community links.